Abyssinians look like a small mountain lion or cougar with almond eyes set in a dramatically marked expressive face and a spectacularly warmly ticked coat that produces a shimmering iridescence whether still or in motion. They are athletic, alert and very active. Even though they are well-muscled their movement is lithe, graceful and very quick. Their carriage is confident and regal, but their antics have caused some to call them "Aby-silly-ans"! The Somali is simply and beautifully a semi-long-haired Abyssinian. It has the same expressive face but with a shaggy ticked coat, ear tufts and a fox-like tail. The Abyssinians and Somalis are also known as the 'preposition' cats because they leave no niche unexplored; they are above, below, in, under, across, beside, between, into, over, among and through everywhere! Perhaps alliteration is an easier way to describe the Abyssinian and Somali: active, awesome, agile, astounding, alert, animated, affectionate, amusing, athletic, astute, amiable and attentive. The Abyssinian is one of the oldest breeds of domesticated cats, but its real ancestry is lost in time. Romantic tales call it the cat from the Blue Nile saying it is a direct descendant of the sacred cat of Ancient Egypt because it resembles the cats depicted in Egyptian murals and artifacts. Others believe British soldiers from Abyssinia (now Ethiopia) brought a cat named Zula home with them to England at the end of the Abyssinian war in 1868. So far, no documentation links Zula to the cats of today and recent genetic studies identify the cats in the coastal area of the Bay of Bengal in India as the Abyssinian's potential forebears. The Abyssinian was developed and refined in Britain. The first Abyssinian arrived in the United States in the early 1900s and they were first exhibited in 1909. 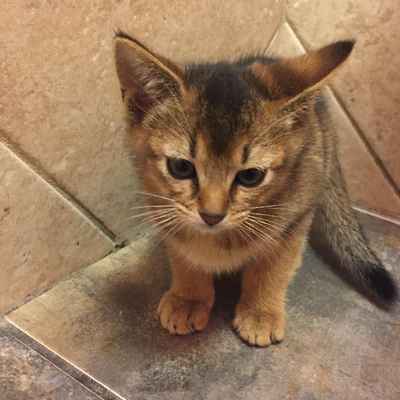 In the 1930s an effort to develop the Abyssinian in the US began and it quickly developed into one of America's favorite breeds because of its expressive eyes, unique coat pattern and personality. The Somali is the stunning long-haired descendant of the Abyssinian and is named for Somalia which borders Ethiopia, formerly Abyssinia, to represent their connection to each other. Abyssinians and Somalis are loyal, affectionate, highly intelligent and very interactive with their owners and environment. No place ever goes unexplored and yet seldom do they knock anything off of a shelf or countertop. They are wonderful companions who are highly interested in everything around them and what everybody is doing. They like a good view of their surroundings, so expect them to find them atop the refrigerator, doors and bookcases. They are entertained by whatever moves outside making bird feeders visible through a window a must. Saying they show an intense curiosity in all that surrounds them is an understatement. Not usually considered a lap cat due to their high energy and curiosity levels, Abys/Somalis do occasionally make visits to your lap or find a way under the covers to spend time near their beloved owners. The way they transform within seconds from a radiant and regal presence into an amazingly playful character with childlike antics and an indomitable spirit is astounding. Engaging companions for people of all ages, they are happiest in the company of others, love to play and will find ways to involve you in their activities. While exceedingly social, they are not always content in large cat populations where they have to share attention. The Abyssinian is a short-haired cat whose coat has an iridescent warmth of color produced by the Agouti ticking, where each shaft of hair has 4-6 bands of alternating rich color similar to that of a bunny coat. The coat is resilient and when rubbed against the lay of the coat it snaps back into place. Similarly colored, the Somali is semi-long-haired with a coat that is very soft and finely textured. Coat texture for both is generally soft, but varies somewhat with different colors because the pigment particles have different shapes and distribution within the hair shaft causing the textural variation. The Aby/Somali head type is a modified wedge with rounded contours. In profile, there is a rise from the bridge of the nose to the forehead with a brow ridge that helps establish the wild appearance to the face. The ears are large and arched forward in alertness not to miss out on anything. The eyes are large, almond-shaped jewels, expressive and richly colored gold, amber or green surrounded by a ring of dark color (eyeliner) that is then surrounded by a lighter color. The muzzle is rounded in contour without being pointy or pinched in appearance. They are a medium sized cat with males weighing 8-10 pounds and females 6-7 pounds. The body is medium long, lithe and graceful with the muscular strength of a fine-motor skilled athlete. The Abnotey/Somali is solidly built with a level flank and a slight arch to the back that is more noticeable when the cat is sitting. The legs are slim, long and well-muscled with oval-shaped feet and an appearance of standing on tip-toes. Abys and Somalis are bred in the following colors: Ruddy, Chocolate, Cinnamon, Blue, Lilac and Fawn and the silver version of these colors where an icy white coloration closest to the skin is followed by ticking up the hair shaft.